Board members supporting the community at one of the SBPA Somerville Street Fairs. SBPA Treasurer Lorraine Sarra (front center) has been volunteering to support businesses for 30 years. It was great to see that Ellen Brain, the new Republican Mayor of Somerville, has a sense of fiscal responsibility while understanding what is needed to drive business for merchants in town rather than destroy them. Local business owners are at a tremendous disadvantage when competing with malls and online businesses. The parking situation in Somerville always presented an additional hurdle. When the Downtown Somerville Alliance (DSA) and BOOM, a group of local merchants organized to have the parking rate increases in town repealed, Mayor Brain reacted swiftly, peeling back the hikes to benefit Somerville and the surrounding areas. The efforts of the DSA and BOOM are without question, deserving of accolades. A recent article in Tapinto Somerville, “Somerville Merchants Endorse Plan to Reduce Parking Lot Fees.” outlined their hard fought victory. However, there is a backstory regarding the Somerville Business and Professional Association (SBPA) that has been ignored. The story deserves to be mentioned, not only because this generous nonprofit was the first to valiantly try to prevent the hike, but also because it serves as a reminder to us all that we cannot meekly allow elected officials to decide our fate. We cannot always mop up a mess. 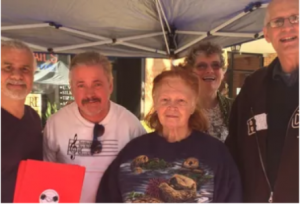 For those in the community who do not know who the SBPA is, it’s a small nonprofit operating in town whose mission is to support local merchants and the community. 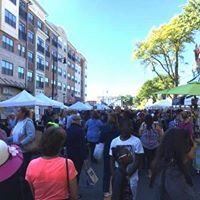 The SBPA is responsible for many events in town that contribute to the unique experience that is Somerville. Events include the horse drawn Carriage rides during Christmas, photos with Santa, Strolling Carolers& Musicians, the Arts and Crafts fair and both the Spring and Fall street fairs. In addition, the SBPA sponsors other town events such as the Tour of Somerville, the St. Patrick’s Day Parade and others. Many students in town have enjoyed SBPA scholarships while organizations such as the Somerville Rescue Squad, the Women’s Shelter and others have received generous donations. Surprising, isn’t it? This little known nonprofit operates quietly while doing so much for Somerville and the surrounding area. Well, it’s time that the SBPA and the merchants who comprise this organization got some credit. It could be argued that the SBPA loosened the jar for this big win for residents and merchants in Somerville. The humble nonprofit was all over this issue from day one. The SBPA sounded the alarm and rounded up the community to fight the parking rate hike. Denial and complacency. Had local merchants and residents fully understood the impact of the rate hike, more people would have been involved. Instead, they swallowed the hike as inevitable and didn’t bother to fight it. Arrogance. It’s entirely possible that the town’s leadership figured that once the rate hike was approved people would grumble, but go back to business as usual, accepting the bitter pill with the quiet desperation that government greed feeds on. Had the DSA and members of BOOM reacted with the same passion and sense of urgency that they showed once the damage was done, it would never have reached this point. This is not meant to be derogatory, but more a statement about human nature. To their credit they didn’t cave to human nature and simply accept the results, but fought to correct them. So while the efforts of the DSA and the merchants are praiseworthy, this backstory regarding the efforts of the SBPA and its members has been ignored. The story serves as a wakeup call. And it just seemed that it was time to give some credit where credit is due. To see the letter to the editor in Tapinto Somerville click here…. October 7, 2018. This Coupon may not be duplicated and is not redeemable in cash nor credit. It must be printed! Electronic versions are not valid. Only this paper-version is valid. To apply to the SBPA Street Fairs, just click on the “applications” tab right here on our website. 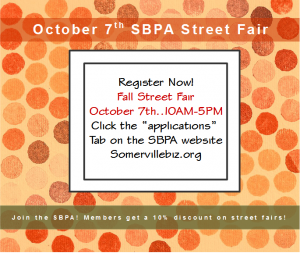 SBPA members get a discount on street fairs (not the arts and crafts fair.) For other benefits of membership, see the post below! Don’t Forget Your New Year’s Resolution to Grow Your Business! It’s always a perfect time to grow your business. Even if yours is an at-home or online business, a brick-and-mortar or service business, joining the Somerville Business and Professional Association can provide major benefits while enriching your local community. 1) INCREASED OPPORTUNITIES FOR B2B NETWORKING Be a part of the local business community. Build connections through SBPA networking events, seminars and monthly Board meetings. Member to member discounts available. For example, members enjoy a 15% discount on ads placed with The Breeze! 2) GROW YOUR FACE BOOK PRESENCE FOR FREE! 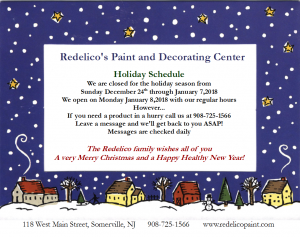 Special posts for your business for the holidays and other relevant events. The SBPA facebook page showcases members’ businesses, promotes “shopping local,” and offers up to date news links about local events. 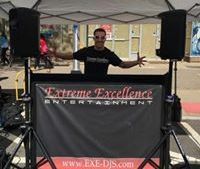 3) ENJOY DISCOUNTS FOR THE TWO ANNUAL STREET FAIRS The street fairs are a great way to showcase your business! The SBPA also sets up a booth and promotes traffic to our members’ booths! 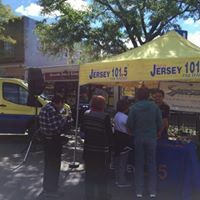 Members enjoy a special discount to the street fairs. 4) BE A PART OF SOMERVILLE’S CHANGING LANDSCAPE Our board meetings, facebook page and community outreach keeps you posted so you can capitalize on all the changes in town instead of being blindsided! 5) THE SBPA HAS YOUR BACK! We fight for changes that can impact your business. We’re a separate, independent business organization that is not run by the town government. That means that we can be a bit more outspoken about issues that might impact your business. 6) ENHANCE YOUR BUSINESS IMAGE BY GIVING BACK TO THE COMMUNITY Displaying the SBPA sticker gives your business credibility and trustworthiness. You can be proud of the SBPA contributions to the community! 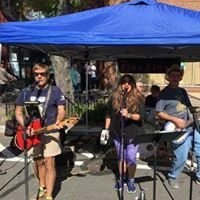 7) BE PART OF SBPA’S OUTSTANDING COMMUNITY EVENTS The SBPA hosts the 2 street fairs, the JC Craft Fair, and Holiday events, such as Meet Santa Breakfasts and Lunches with photos, plus the famous Carriage Rides in town. 8) MEMBERS ONLY EVENTS Be a part of special SBPA members-only events that drive traffic though the door and into your store! Become a member and be a part of the pitching and planning process! 9) HOST AN EVENT This is an awesome opportunity to create exposure and solidify your business through hosting an SBPA event in your store! We’ll help you promote it for FREE! 10) INCREASED MARKETING FOR YOUR BUSINESS-all FREE! FREE exposure on our facebook page, a FREE link to your business on our website, and FREE mentions on related email campaigns, event flyers, and press releases. We care about your success! Join today! To join, click on the “applications” tab on this website and follow the instructions. A series of upcoming posts will explore the evolution of shopping and its impact on local businesses. There’s nothing like getting a sense of how times have changed like a side by side eyewitness comparison of someone who has not only been a Somerville shopper since 1964, but a Somerville small business owner as well. Loraine Sarra had a lingerie shop on Main Street that many of you probably remember-Beneath it All. 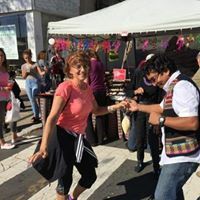 Lorraine’s “love local” profile is underscored by her 30 years of volunteering to help small businesses in town through the Somerville Business and Professional Association. She currently holds the position as Secretary Treasurer for the SBPA. The SBPA does more than help small businesses, it enriches the community as well. Many events downtown such as the “Strolling Carolers and Musicians” and the horse drawn “Carriage Rides” are Christmas memories compliments of the SBPA. In addition, the SBPA has donated to local scholarships and organizations such as the Somerville Rescue Squad, the Food Bank of Somerset County, the Women’s Shelter ,and various other organizations in the county. It seemed like it would be interesting to get a glimpse into Somerville’s Christmas shopping past through the eyes of someone who’s seen it all. I asked her to walk us down Somerville’s holiday memory lane. Q: How would you compare today’s downtown Christmas shopping experience to when the SBPA started? L: Well when we moved into the area in 1964 there wasn’t any mall then. When the SBPA started there was around 300 retail stores in town. Only a few small places to eat or have coffee- Woolworth’s, Buffalo Bill’s (now Phoenix Cafe) Lorraine’s Sweet Shop and so much more. Everything you needed was available, including drug stores and food stores. Q:-Sounds like a pretty bustling scene. What did it look like in terms of holiday decorations, music and events back then? L: There was a sound system on the roof of one of the stores and holiday music was played until the holidays were over. There were enormous tress that were wrapped in lights and tinsel, with large wooden soldiers standing in the tinsel. Q: A lot of people are not aware that the SBPA sponsors alot of Christmas activities that have created some wonderful memories for their family. Would you describe the Christmas activities that the SBPA sponsors for Somerville? L: To my knowledge, the SBPA had always done pictures and brunch with Santa. Q: Sorry to cut you off there, but I saw that pictures with Santa were cancelled this year? L: We try to encourage our members to host some of our events. This year the restaurant that always hosted Santa didn’t respond to our request, which is sad for so many people who enjoy that tradition. Q: Do you expect we’ll have them again next year? L: I have gotten quite a few calls to do so and hope that we can. It’s an event that the parents also enjoy. Anyway, The SBPA also ran “Santaland” which was a craft fair with hand made items by a senior group. We also had musicians every weekend before Christmas and at least one carriage ride per one Saturday. Q: So aside from the senior crafts a lot of that is still going on. 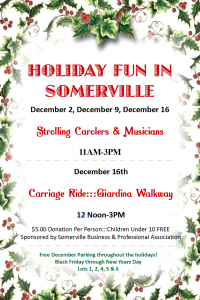 L: Yes, the Christmas poster up on the SBPA Facebook page lists all the events and times for the Strolling Carollers and Musicians as well as the Carriage Rides. Q: What you’ve described could be a parallel to the Somerville’s Ghosts of Christmas present and past. What, in your opinion, would Somerville’s Ghost of Christmas future have to say? L: Well, it would be nice to have some of that available again-the variety we used to have in terms of shopping. If you have a town full of residents, why should they spend their salary in other towns? How many times a week will they eat out? Parking will still be a problem. Q: Do you have any ideas on how that might happen? How Somerville could attract a wider variety of businesses? L: Retail as it used to be is getting to be something of the past. Internet shopping has taken over the market. I can understand that. Most of online shopping offers free shipping which is great. L: I wish everyone a very Merry Christmas and a Happy, Healthy and Prosperous New Year. 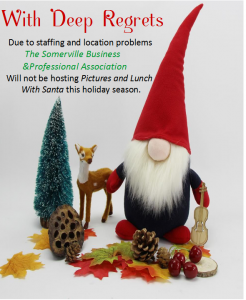 For more information about the Somerville Business and Professional Association visit the website at Somervillebiz.org and “like” the facebook page. 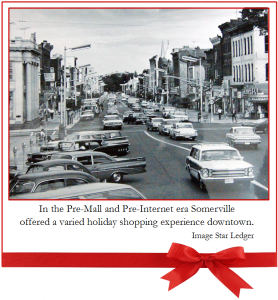 Add your own Somerville Christmas memories and pics in the comments! ~Diane Gerber is the facebook admin for the SBPA and a believer in loving local. She formerly managed Aternatives of Raritan’s It’s all good” store on Main Street that offered training for job seekers with disabilities. Nothing says Christmas like a train under the tree! 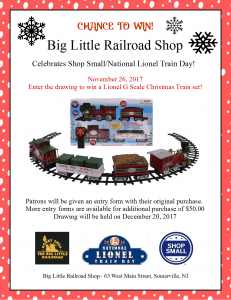 Make some warm and wonderful holiday memories! 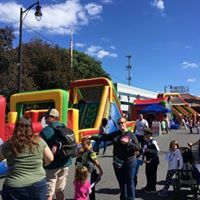 The Fall Street Fair Was a Huge Success! It was a beautiful day to make some memories on Main Street. As always, vendors, musicians and kid friendly activities provided fun for the whole family. The next street fair will be in the Spring-we’ll keep you posted! Applications for next year’s fairs will be posted soon. Check the “events” tab often and like us on Facebook! 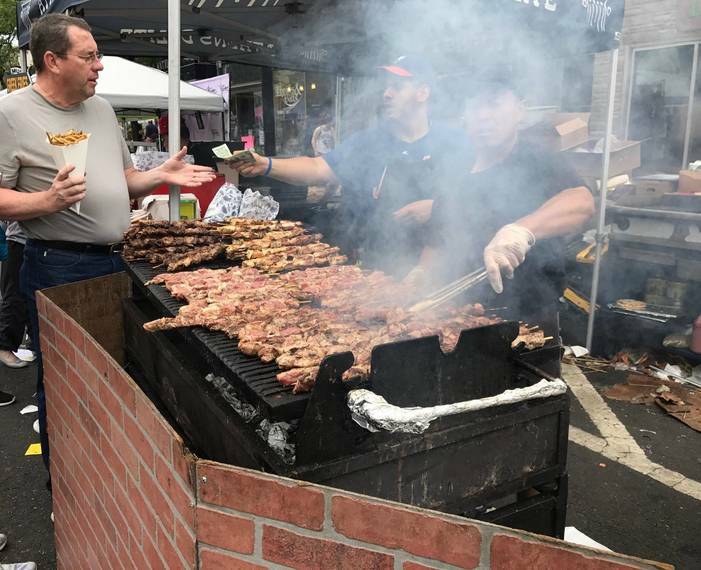 SOMERVILLE, NJ – Main Street was packed with thousands of visitors Sunday for the annual Street Fair and Music Fest sponsored by the Somerville Business & Professional Association. Hundreds of vendors lined both sides of the street, displaying original artwork and handcrafted home goods. There were home improvement specialists, cell phone providers, non-profits soliciting donations, Super Heroes, Realtors, vendors selling clothing, shoes, cosmetics and other items. But the lines were longest wherever there was a food vendor. There were hot pretzels, pizza and Italian ices, sausage and peppers, shish-ka-bob, ice cream, funnel cakes, corn-on-the-cob, freshly-brewed coffee and ethnic foods – something for everyone.